Northside Hospital Cancer Institute and Georgia Cancer Specialists offer Phase I through IV clinical research trials. Our Phase I program includes novel “first in human” trials. We offer community-based medical oncology and hematology services and we also provide a full range of support services for patients in Georgia, including imaging services, retail pharmacy, nutritional counseling and wellness counseling. 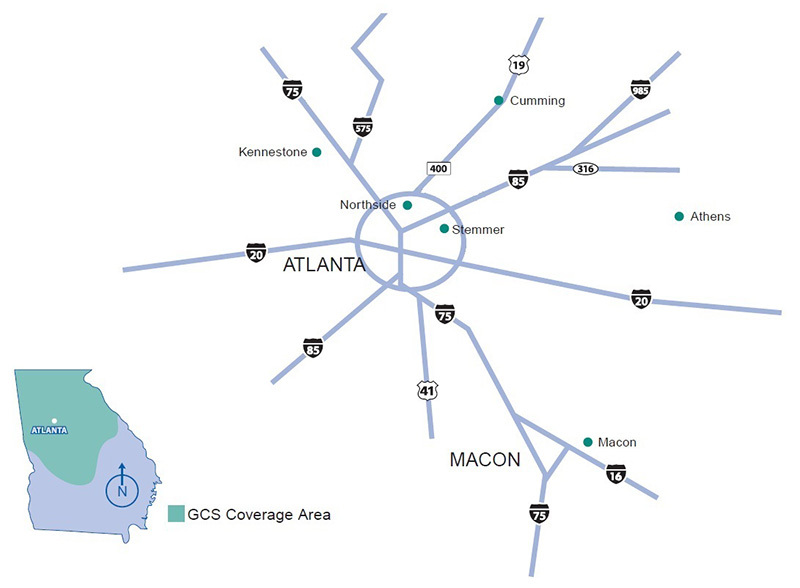 Seven dedicated research clinics are located in geographically distinct practice areas. Our clinical trials are conducted at our Kennestone (Marietta), Northside (North Atlanta), Stemmer (Decatur), Blairsville, Macon, Athens and Canton (Forsyth) offices. Because of our strong commitment to research, we are affiliated with the University of Alabama-Birmingham Comprehensive Cancer Center (UABCCC), making it possible to bring leading-edge cancer care to our patients. Dr. Rodolfo Bordoni is the Director of Clinical Research at GCS and monitors trials from our Northside location. Currently, fourteen other sub-investigators oversee the treatment of all GCS patients on clinical trials. The research team is comprised of physicians and specialized clinical staff trained in research design, data collection, and analysis. Dr. Rodolfo Bordoni, MD and Dr. Pradeep Jolly, MD monitor trials at our Northside location. Monitoring trials from our Stemmer location are Dr. Aaron Alizadeh, MD, Dr. Simbo Aduloju, MD, Dr. Jayanthi Srinivasiah (Dr. Jay), MD, and Dr. Kathleen Lambert, MD. Monitoring trials from our Macon-Coliseum location are Dr. Cheryl Jones, MD , Dr. Premila Malhotra, MD and Dr. James Lennon, DO. Monitoring trials from the Kennestone location are Dr. Gena Volas-Redd, MD, Dr. Crain Garrot, MD, Dr. Lynn Zemsky, MD, and Dr. Navneet Dhillon, MD. Monitoring trials from our Athens location are Dr. Ranjana Bhargava, MD, and Dr. Priya Rudolph, M.D., Ph.D. Monitoring trials from our Canton location are Dr. Gena Volas-Redd, Dr. Crain Garrot, Dr. Lynn Zemsky and Dr. Navneet Dhillon, MD. Monitoring trials from our Blairsville location is Dr. Aaron Schueneman. Monitoring trials from our Center Pointe location is Dr. Nishan Fernando, MD.